Looking for a job? America has 5.7 million openings. That's close to the record number of job openings reported by the Labor Department since it started tracking them in 2000. The US had an all-time high of 5.9 million openings last July. The numbers bear a mix of good and bad news. Good news: Employers are hiring and workers are starting to feel more confident about leaving a job for another one. It's reflects a much improved situation from the Great Recession. Bad news: Not all employers can find the skilled workers they need. Experts say that such a high number of job openings is due partially to a gap between the job skills employers demand and the skills job seekers have. Many professions -- such as electricians, carpenters, waste management collectors -- are in short supply. With limited workers, employers are forced to hike up wages for those positions to retain or recruit new employees. For example, electricians' wages are growing at about double the national average. Last fall, electricians' weekly wages rose 3.9%, according to the most recent Labor Department data. The national average weekly wage for all jobs only rose 2.1% over the same time. That's good news for electricians getting a pay bump, but it illustrates the larger issue of a skills gap in the US, which is one factor holding down overall wage growth in the US. Sluggish wage growth is a major reason why many Americans feel left out of the economy's recovery from the recession. At the same time, the rapid pace of changes in technology is replacing many blue collar manufacturing jobs, challenging workers to continuously find new job skills. Automation weighs down wage growth too. Still, the high number of job openings reflects good developments too. During the recession, workers were reluctant to give up their job, fearing they couldn't find another. The US quits rate fell to 1.3% in 2009. 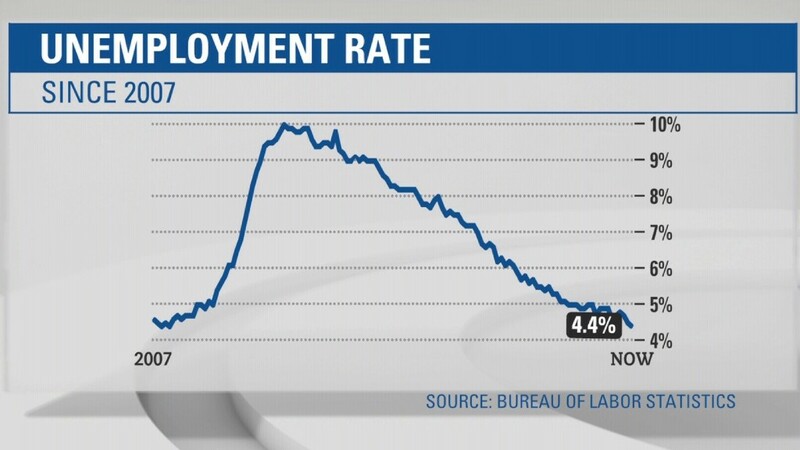 But now it's at 2.1% -- where it was before the Great Recession began in late 2007.